Order an Family Med Pack from VOM. Write your name on the front of the pack so the recipient can pray for you. VOM ships the pack to the field, where it is given to a Christian family. Before distribution, field staff will customize the pack with specific items, such as infant formula and diapers, feminine hygiene products or pharmaceuticals. Your pack will be distributed in the country where it's needed most. 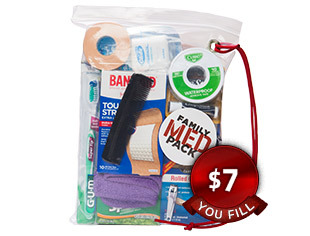 If you prefer to have VOM fill the kit, visit our Sponsor a Family Med Pack page.